Have you heard about agrihoods? I’ve seen this term popping up more and more recently. Short for “agriculture neighborhood,” essentially, an agrihood is an urban or suburban neighborhood built around farms. Here’s a video about one of the largest agrihoods in the country located in Ashburn, Virginia and another agrihood in Detroit. There are thought to be more than 200 agrihoods around the country, and they are growing in numbers as more and more people become interested in getting closer to where their food is grown. So, how is it possible to turn such a big idea into reality? Last weekend at The Livestock Conservancy Conference, I had the pleasure of meeting Kay Grimm and Sue Spicer – the inspiring creators behind the Green Picket Fences Initiative. Through this initiative, Kay and Sue have made the agrihood idea come alive in their neighborhood of Willard Park in Indianapolis. Describing Willard Park as a neighborhood “caught between the cracks,” Kay and Sue along with their neighborhood association embarked on creating a new story for their neighborhood built on permaculture and sustainability principles. 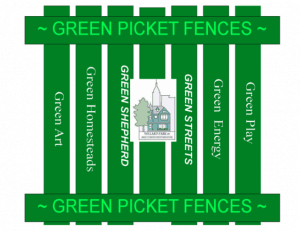 Combining art, homesteading, energy, and play initiatives, they are transforming the neighborhood, connecting community members to where their food comes from, growing food, and building job opportunities. In addition to their 1-acre permaculture fruit farm Fruit Loop Acres, there are Jacob sheep mowing overgrown vacant lots, community art projects, a mobile golf cart produce market, and gardening initiatives. They have many other ideas in the works to build out their agrihood such as a granary and meat processing, canning, and bottling enterprises. Do you live in an agrihood or would you like to? We’d love to hear your thoughts below. For those of you who live in urban and suburban environments, Kay and Sue have proven that homesteading is not only possible but could transform your community. Fascinating Blog & Video. Thanks for sharing unique information.